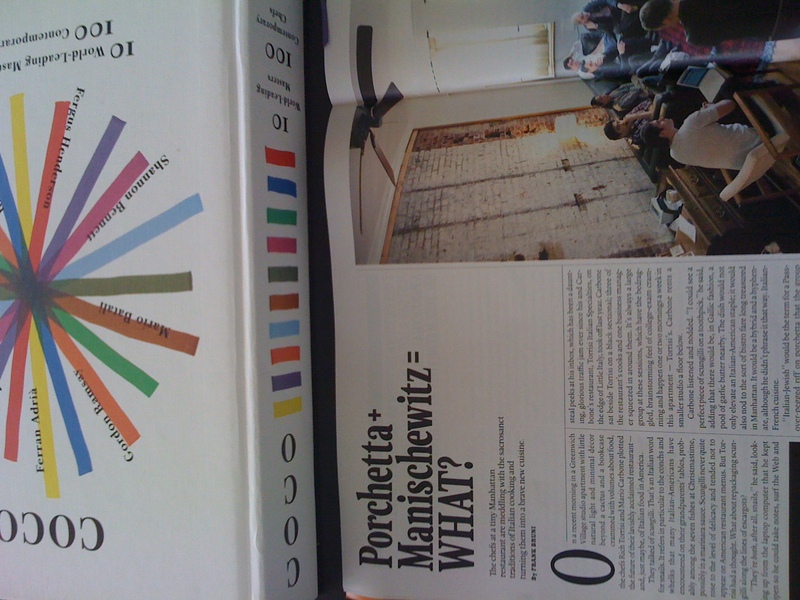 Porchetta + Manischewitz = WHAT? That is the title of a Sunday New York Times Magazine piece by Frank Bruni on the wizards behind Torrisi Italian Specialities, a small but game-changing restaurant on Mulberry Street in Manhattan. On Saturday I was just singing the praises of this small Italian bistro to a friend visiting from out of town. “You. Must. Eat. There.” I chanted. Back in 2009 I was editing a book for Phaidon called Coco: 10 World-Leading Masters Choose 100 Contemporary Chefs. Mario Batali, one of the book’s curators, selected the young Mario Carbone as one of his top-ten emerging chefs. Carbone, a Queens boy, had worked for Batali at Babbo and Del Posto, but in Coco we were discussing his then-new restaurant Aeronuova at the Jet Blue Terminal at JFK airport. I don’t think that gig lasted very long. In the summer of 2009 Carbone opened this tiny storefront with his partner Rich Torrisi and it soon went from a splash to explosion onto the New York restaurant scene. Bruni comments that the two of them don’t even have a publicist; but the restaurant, like the food, seems to speak for itself. I look forward to trying the Italian-wedding-soup dumpling. You. Must. Eat. There. Or don’t! Better chance that I’ll get a table. I thought I recognized Mario Carbone’s name but I couldn’t place it. Still haven’t been to Torrisi but would love to. Thanks for connecting the dots!